“Waiting for Their Stars” by Udo Keppler. 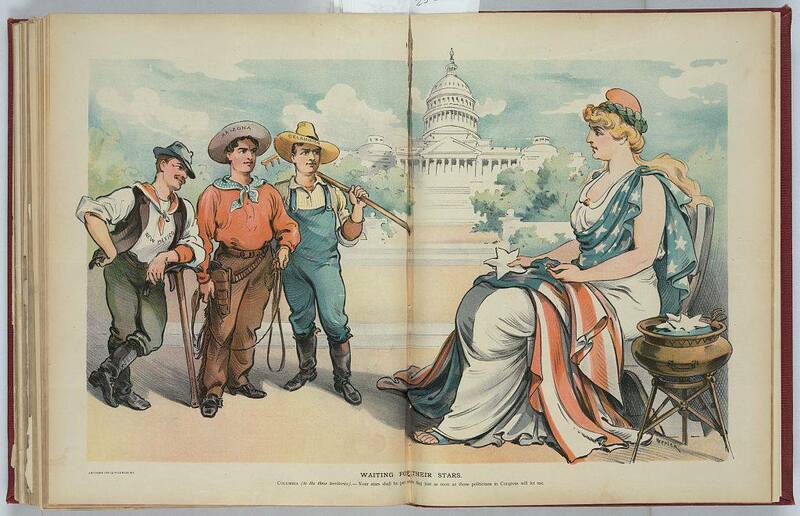 Oklahoma gained statehood on November 16, 1907, thereby gaining a place on the flag effective July 4th, 1908. New Mexico and Arizona did not achieve statehood until January 6th and February 14th, 1912, respectively. As such, New Mexico is represented by the 47th star and Arizona is represented by the 48th star. A link to Nadine Arroyo Rodriguez’s “The Show” segment regarding our journey from territory to state can be found below. Map of Papago Saguaro National Monument included as page two of President Woodrow Wilson’s proclamation establishing the park. 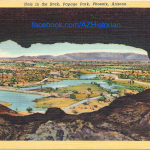 A post-National Monument era postcard showing water features added to the landscape following delisting, as viewed from Hole-in-the-Rock. Arizona is home to numerous famous and well-visited National Parks and National Monuments, including the majestic Grand Canyon National Park, the historic Casa Grande Ruins National Monument, and the other-worldly landscapes of Petrified Forest National Park. Notably, the state is also home to what once was Papago Saguaro National Monument, the first ever National Monument to be abolished. President Woodrow Wilson signed Papago Saguaro NM into existence via a proclamation on January 31st, 1914 – one-hundred years ago last Friday – setting aside approximately 2,050 acres of federally-owned desert land significant for its “splendid examples of the giant and many other species of cacti” and “numerous prehistoric pictographs.” The presence of several Native American petroglyphs and the natural beauty of the area’s Sonoran Desert flora and red rock buttes made the site an obvious choice for designation and the protection such status affords. However, neglect and conflicting ideas regarding proper land usage combined to ensure that Papago Saguaro National Monument did not last. The area now known as Papago Park has long proved tempting to would-be homesteaders and profiteers alike. Late nineteenth-century and early twentieth-century Valley residents filed numerous homestead and mining claims within the boundaries of the present-day park. While, in theory, declaring the site a National Monument protected it from such usage, many still aimed to use the land in an entirely different manner than envisioned by President Wilson. Prior to the area being designated a National Monument, the Salt River Valley Water Users’ Association constructed the New Crosscut Canal and a hydropower plant in close proximity to the soon-to-be-declared park. Following Wilson’s 1914 proclamation creating Papago Saguaro NM, requests were made to sink exploratory oil wells on the land, clear an airstrip to provide access by plane, extract shale deposits for use in cement to be manufactured on-site, and to use the park in several other ways contrary to its intended purpose. While most such proposals were denied, the cement plant did come to fruition. Use – or misuse, rather – of the land further compromised its appeal. 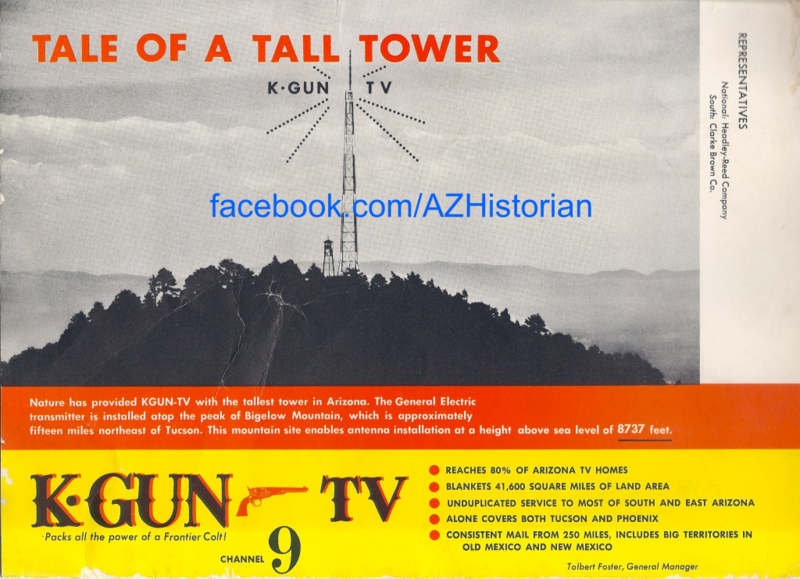 The KKK staged a 1922 rally in the monument, numerous Phoenix businesses saw fit to paint advertisements on the walls of the iconic Hole-in-the-Rock, one group built a picnic table inside the opening of another butte, and many are thought to have pilfered cacti from the park for their own use. Limited conservation funds, misuse by local park-goers, and the monument’s relative remoteness and low out-of-state visitorship figures compounded the many other challenges federal officials faced in overseeing Papago Saguaro, making its status as a National Monument untenable. Ironically, while Ralph Cameron, Carl Hayden, and others had fought in Congress to set aside the land surrounding the red rock buttes of today’s Papago Park less than two decades earlier, 1929 saw Arizona Congressman Lewis W. Douglas introduce legislation to abolish the National Monument and transfer ownership, for a small fee, to the state of Arizona. 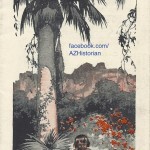 Papago Saguaro National Monument was abolished on April 7th, 1930, with the land turned over to the state government. No longer a federal property, the land was available for a greater number of uses. In the years following its delisting, a bass hatchery, Governor Hunt’s white pyramidal tomb, a Depression-era Civilian Conservation Corps camp, and a World War II prisoner of war camp were added to the grounds of the former National Monument. 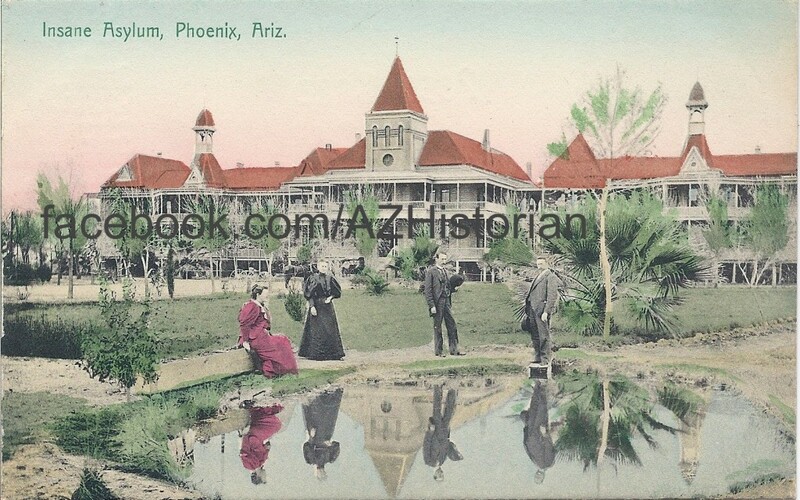 After the state sold the bulk of the park to the city of Phoenix in 1959, the land gained a golf course and a zoo, adding to the Desert Botanical Garden established by Gertrude Webster in 1939. Although classified as parkland governed by federal, state, or local authorities for decades, some continue to suggest differing uses for the land, including Frank Lloyd Wright’s idea for a new state capitol to be called Pro Bono Publico and constructed in the middle of the park, a developer’s scheme to erect a 600-foot-tall saguaro cactus-shaped, neon-lined observation tower in the park, or other, more recent proposals.